As we shut down a glorious summer of tennis and look forward to a great fall going into winter tennis, I am just floored by the amazing work done on the pro tour by the old veterans who continue to amaze. When I played on the tour, mainly in the 1990s, players in their 30s were rare. McEnroe, Connors and Navratilova were out there, but not winning in the way Fed, Venus, Serena and Rafa are winning these days. There are so many other players in the singles and doubles rankings playing extremely well into their 30s. I believe so much of it is the evolution of nutrition and athletic recovery. Venus Williams spoke last year at Wimbledon about “an infinity inside” that makes her feel like she can go on forever. She often talks about the process of improving and getting better, and says that in her heart she will always love the game of tennis and be a tennis player who wants to improve. I am so impressed with these legendary leaders in the game. So how is your game these days? Is it improving and moving in the direction that helps you win more key points? 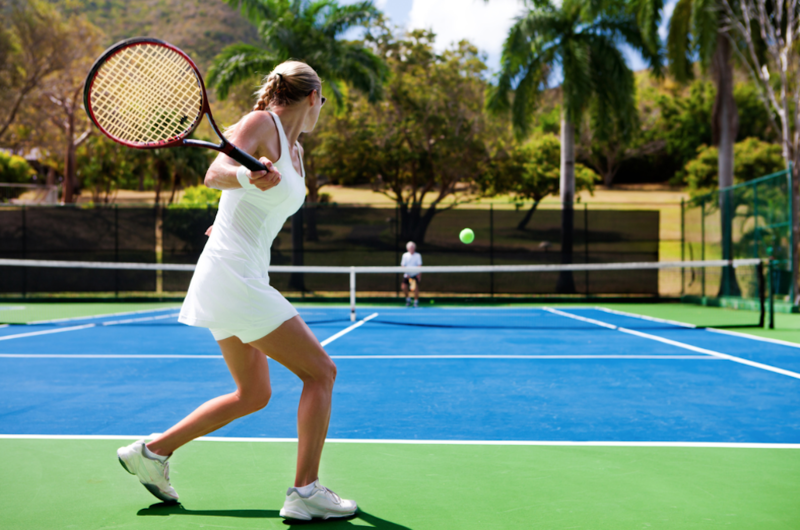 If not, maybe you can use this next tennis tip to win more points. I’m a big believer in moving the ball to the open court. From singles to doubles, when you look to hit shots to openings, it’s always going to keep your opponents moving. One thing that I explore during matches when my open court approach is not working is to hit down the middle of the court. This go-at-your-opponent strategy forces the other side to move out of the way to hit the ball. Since tennis players are used to moving toward the ball, having to get away from it poses a greater challenge. My dad took up tennis late in his athletic life and hated the ball that jammed him. He hated it so much he thought the answer was to saw off about an inch of the handle to deal with a body shot. I would leave racquets at home and come back from college or the tour with many of my frames sawed off! While this made them useless to me, my dad really thought it helped him. I told him that if he thought that shortening the frames was the magic to his game, then he should do it to his racquets, not mine. Of course, he would laugh and say he liked his racquets and that my frames get better when they’re shorter. Anyway, please don’t saw off your frames. Just move your feet to set up for a body ball. So if you’re not playing well or losing a tennis battle, try going right at the net player or right down the middle and see how they handle a ball in the body. You may surprise yourself! Always remember: never change a winning tactic and always change a losing game plan. Play tough and play smart! Keep going for the lines!